Eye drops are used to treat symptoms of eye allergies. Symptoms include itchy, watery, stinging, red, sore, and swollen eyes. There are both over-the-counter and prescription eye drops for allergies. Over-the-counter (OTC) drops are available in decongestant and decongestant/antihistamine combinations. Decongestant drops include Visine, Naphcon, and generic forms of naphazoline. 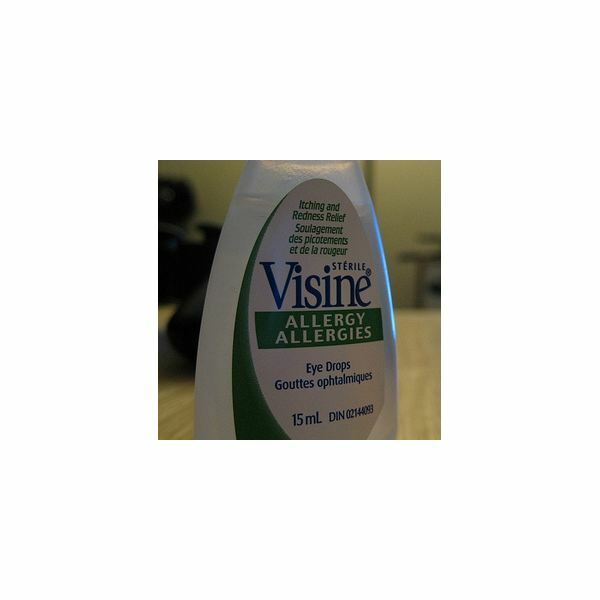 Decongestant/antihistamine drops include Visine-A, Naphcon-A, and generic forms of naphazoline/pheniramine. These drops should be used for short-term use only. Long-term use can lead to dependence on the drops. People with glaucoma should not use these drops, and people with blood pressure or heart problems should use with caution. Recently, the FDA approved an eye drop (Alaway) for OTC use that is expected to not cause dependence with long-term use. Antihistamine drops (Emadine): These work well with allergies on an "as-needed" basis. Mast cell stabilizer drops (Crolom and cromolyn generics, Alocril and nedocromil generics, Alomide, Alamast): These work well to prevent symptoms before allergen exposure. Antihistamine/mast cell stabilizer dual-action drops (Patanol, Optivar, Elestat, Zaditor): These work better than single-action agents. Non-steroidal anti-inflammatory drops (Acular): These work similar to aspirin and ibuprofen (should not be used if you have a sensitivity or intolerance to aspirin). Corticosteroid drops: These drops can lead to severe complications and are usually only used in severe cases. Wash your hands. Tilt your head back and pull your lower eyelid down to form a pocket. Using your other hand, hold the bottle close to your eye without touching it. Gently squeeze the bottle to administer one drop in the pocket. Close your eye and tip your head down. Do this for two to three minutes without squeezing your eyelids or blinking. If you are instructed to administer more than one drop, wait five minutes before instilling the next drop. A possible side effect that may occur from using eye drops for allergies is a temporary stinging or burning after administering the drops. If this persists, contact a doctor. Do not use eye drops for allergies if you have an eye infection. If you wear soft contact lens, wait at least 10 minutes after administering the eye drops to insert your lens. Be careful to not contaminate the dropper tip or solution.